Beginning on October 17th, 2016, Raptor Excavating and Contracting, LLC of Yacolt, WA, under contract to the City of Kelso, will begin work to repair two pavement sections in S. Pacific Avenue. One at Oak St. and the other at Mill St. Marking and other preparatory work has already begun. The work will be conducted during daylight hours and is scheduled to be finished by October 31, 2016. This work will create disruptions to the flow of traffic. At times, detours will be used to redirect traffic around or through the work area. Every reasonable effort will be made to allow you access to your destination. 5th Ave. will be closed at Main Street this Friday, 7:00am to 6:00pm for storm manhole installation. 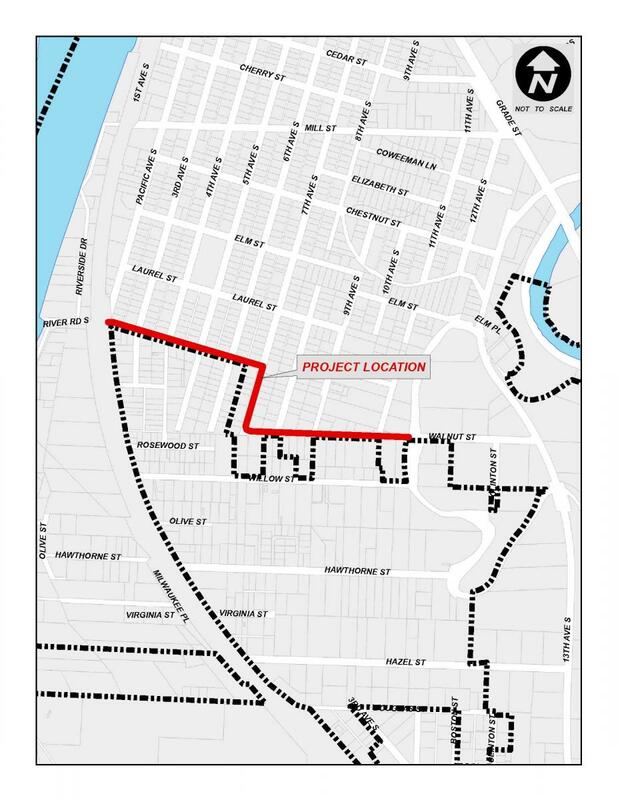 As part of the Yew Street Roadway Improvement project, the Nutter Corporation of Vancouver, Washington, under contract to the City of Kelso, will be installing a utility pipe on S. Walnut Street. Surveying, marking and other preparatory work has already begun. During the week of 10/10/2016 to 10/14/2016, this work will require temporarily closing 10th and 11th Avenues at Walnut Street. One of the avenues will remain open for area traffic circulation; both avenues will not be closed at the same time. The work will be conducted during daylight hours. City of Kelso Engineering Department (360) 423-6590. Beginning on October 10, 2016, Advanced Excavating Specialists, LLC of Longview, WA, under contract to the City of Kelso, will begin a storm drainage project to repair and improve the storm drainage system at Apple Lane and West Vista Way. Inspection, marking and other preparatory work has already begun. The work will be conducted during daylight hours and is scheduled to be finished by October 31, 2016. This work will create disruptions to the flow of traffic. At times, detours will be used to redirect traffic around or through the work area. As a local resident, every reasonable effort will be made to allow you access to your destination. Beginning on October 17, 2016, Advanced Excavating Specialists, LLC of Longview, WA, under contract to the City of Kelso, will begin a street repair project to remove and repair a number of damaged pavement and sidewalk sections along S. 8th Avenue between Vine Street and Allen Street. Inspection, marking and other preparatory work has already begun. The work will be conducted during daylight hours and is scheduled to be finished by October 31, 2016. On September 28, City Manager Steve Taylor gave a State of the City presentation at the Kelso-Longview Chamber of Commerce Quarterly Luncheon. Click here to view the 2016 State of the City presentation. Beginning on September 19, 2016, Nutter Corporation of Vancouver, Washington, under contract to the City of Kelso, will begin a construction project to construct roadway improvements to Yew Street between S. Pacific Way and S. 7th Avenue. The project also includes installation of a stormwater utility system on S. 7th Avenue and Walnut Street. Work will be conducted during daylight hours and is scheduled to be finished within 3-5 months, depending on weather. During construction there will be local access for residents and their guests. The City and Nutter Corporation will work to minimize the inconvenience, however, minor delays should be expected. We appreciate your cooperation and patience. If you have any questions or concerns please feel free to contact the City’s project manager, Tim Shell, at (360) 577-3322. Beginning on September 14, 2016, Brookhart Excavation LLC of Longview, WA, under contract to the City of Kelso, will begin a construction project to replace the existing sanitary sewer line. The will be conducted during daylight hours and is scheduled to be finished by November 25, 2016. Beginning on August 29, 2016, Clark and Sons Excavating, Inc. of Battleground, WA, under contract to the City of Kelso, will begin work to replace catch basins located on Allen Street between N. 23rd Ave. and Crescent Ave. Inspection, marking and other preparatory work has already begun. The work will be conducted during daylight hours and is scheduled to be finished by September 2, 2016. Beginning on August 29, 2016, Lakeside Industries, Inc. of Longview, WA, under contract to the City of Kelso, will begin a restoration project to improve the existing road surface of Talley Way. Inspection, marking and other preparatory work has already begin. The work will be conducted during daylight hours and is scheduled to be finished by September 6, 2016. The streets must be completely clear of vehicles during these scheduled dates to effectively complete the street repairs. Any vehicles not cleared may be subject to towing and impound at the owners expense. Unfortunately disruption is an expected consequence of the construction. The City will work to minimize the inconvenience and we appreciate your cooperation and patience. If you have any questions please feel free to contact me at 360.577.3377.